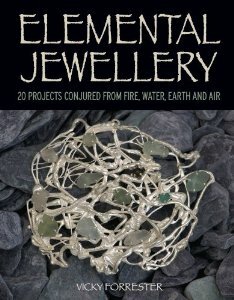 Elemental Jewellery – Here’s a sneak peek from the foreword of my book ‘Elemental Jewellery’, showing how I take inspiration from the elements. In describing my own process of designing I hope that others can find parallels that help to engage with their own creative practice in new ways…. 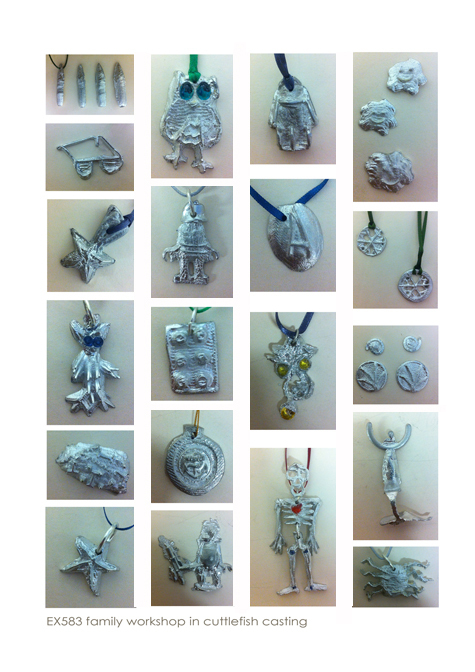 Look at these fabulous pewter pendants / medals / objects made by children and their adults at Flux Studios this weekend! We had an invasion of robot – spacemen whose inspiration came perhaps through cloudy skies on shooting stars. Thankfully our own earth based ghoulies in the form of skulls, skeletons, spiders and night birds were at the ready to defend us! 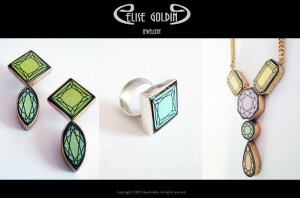 Elemental jewellery contains 20 projects that aim to introduce new approaches to designing and making jewellery. Using Earth, Air, Fire and Water as sources of inspiration, the step by step projects explore how these themes can provide potent undercurrents in the conceptual, material and technical development of your designs. The book also contains 4 inspirational projects from special guest contributors Imogen Belfield, Henrietta Fernandez, Nora Fok and Louise Loder. 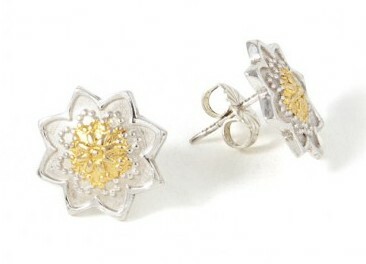 Southwark Weekend Courses in Jewellery making – get your places now! We have 2 great weekend jewellery courses for Southwark residents, once again generously supported by Southwark Adult Learning Services. Come and make something really special and unique! Free Family Workshops in Jewellery, for locals, coming up! Thanks to funding from Southwark Adult Learning Services we have more of our popular Family Workshops in jewellery making to offer the local community, and they are absolutely free! These Introductory family workshops aim to get children involved in making and enjoying their creativity. At Flux Studios we provide a supportive environment where families / children and their carers can actively engage with creative and craft processes together in the professional environment of an artist studio. 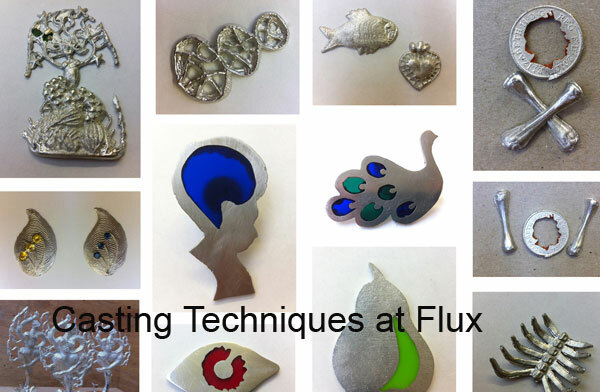 We have some very exciting jewellery workshops in specialist techniques coming up at Flux. Here are two weekend courses coming up in the next months. 1. Sat/Sun 20/21 October – Keum Boo workshop with Barbara Yarde. When I am in the studio for my three hour class, I am completely lost in the world of learning new skills and producing an original outcome.